Well I shared my Chicken Meatballs Recipe with you last week and I thought just in case you missed this recipe in my newsletter, you might like the side dish I served with them. So here are my gluten and dairy free Roasted Brussels Sprouts with Bacon. If you’re thinking you don’t like Brussels sprouts I challenge you to make these to give them a try. I know you’re thinking about those over boiled sulfurous smelling vegetables you were told to eat as a kid. However, if you cook them properly you will have a delicious sweet dish. Trust me, have I let you down yet? What’s so good about this recipe? Anything cooked with bacon tastes great so why not? They are loaded with Vitamin A and C plus healthy quantities of fiber, iron, phosphorus and potassium. Start off with a good choice when bringing home your Brussels sprouts. Look for firm, green, uniform sized Brussels sprouts with no browning leaves. The smaller the sprout the sweeter and more tender they will be so if you’re taking the challenge because you think I just might be right, then go for the small ones. Store loosely wrapped and no longer than 3 days as the longer they are around the more their flavor intensifies. I love when I find them on a stalk and can pick them off myself. They are in season from late August through March so go shopping now. Let me hear how yours turn out. Toss your Brussels sprouts in olive oil. 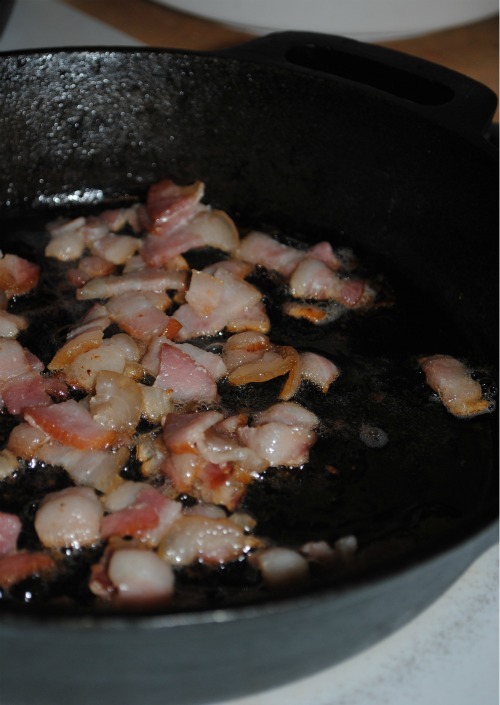 Crisp the bacon lardons in a cast iron skillet. Turn off the burner. Take the bacon out and add in the Brussels sprouts cut side down. Sprinkle the bacon on top. Put into a 375 degree preheated oven and roast for 30 minutes. Halfway through flip the Brussels sprouts over. You are looking for the sprouts to brown and start to caramelize and be fork tender. Carefully remove from the oven because the handle will be hot. Note: If you don’t have a cast iron skillet or any oven proof skillet you can use a cookie sheet for the Brussels sprouts. Just cook the bacon in a regular skillet pouring the bacon over the sprouts on the sheet and then bake. If you are looking for a little different twist try White On Rice Couple’s version with Balsamic Vinegar. It’s really good too. Or you might like Elise’s Simply Recipes version with garlic and lemon. Melissa you're an experienced Brussels sprouts eater. I was venturing out into unknown territory. I think I'm going to give them a try with the vinegar next. I love fresh Brussels sprouts roasted in olive oil, salt, and pepper! And with bacon? I'm so there! Shirley I think I'll have to change my middle name soon. Diane Bacon Eblin. How does that sound? Thank you Pat. This makes them as much fun to make as they are to eat. 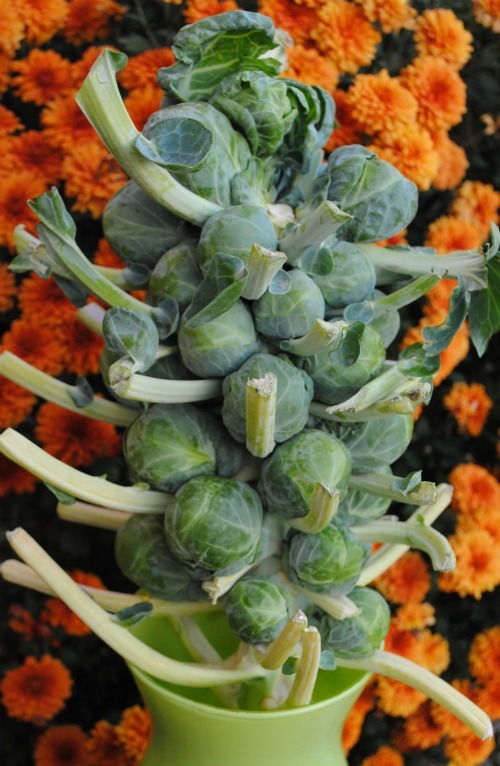 I have always had my sprouts in a casserole with almonds and croutons…I was lamenting what to do with the 8 stalks of brussels in my garden…now I know! Thanks! Terri if you get tired of eating them you can always send a stalk here. Are they easy to grow? Maybe I'll give them a try next year. Cool garden. 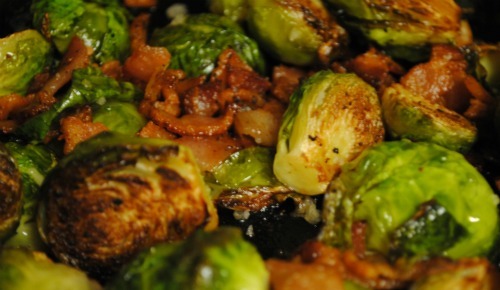 Love cooking brussels sprouts with bacon! Its the tastiest way to eat them. 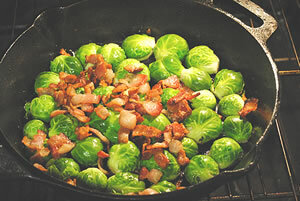 I have a similar roasted brussels with bacon recipe on my blog. Still couldn't get my husband to even try them! He is so sprout averse it is inseane. I LOVE these though Diane. This is one of my favorite ways to make brussels sprouts Diane! Tony finally got over his fear of them (his mom murders vegetables and makes the most vile over-boiled brussels you've ever tasted!) and is eating them now. I'll have to put the bacon ones back on the menu for him too!